The rail network and Northern Busway have helped to show that when relatively fast, frequent, reliable and high-quality services are provided, that Aucklanders will flock to use them. At 25.6 million trips, now around 28% of all public transport use in the region takes place on our burgeoning Rapid Transit Network., It has accounted for about 55% of the growth that has occurred over the last five years – although growth on the rail network has notably slowed since late last year. Once again, Auckland Transport have kindly provided us with the numbers breaking down the results. This allows us to see how many trips travel from every station to every other station. The data is based on completed HOP trips i.e. where both the origin and destination are known. This means trips aren’t included, such as where someone has forgotten to tag off or for special events where travel is included as part of the ticket. This accounts for about 90% of all rail trips. The busway numbers match the overall result though suggesting the monthly numbers AT report are actually understated. The numbers for rail and the busway are independent of each other so we can’t see how many people transfer from a train to the busway. First up, the total boardings for busway and train stations. Britomart and Busway boardings in the city are truncated so it’s possible to see the outcomes of other stations easier. And here is the change in boardings from this year to last year. 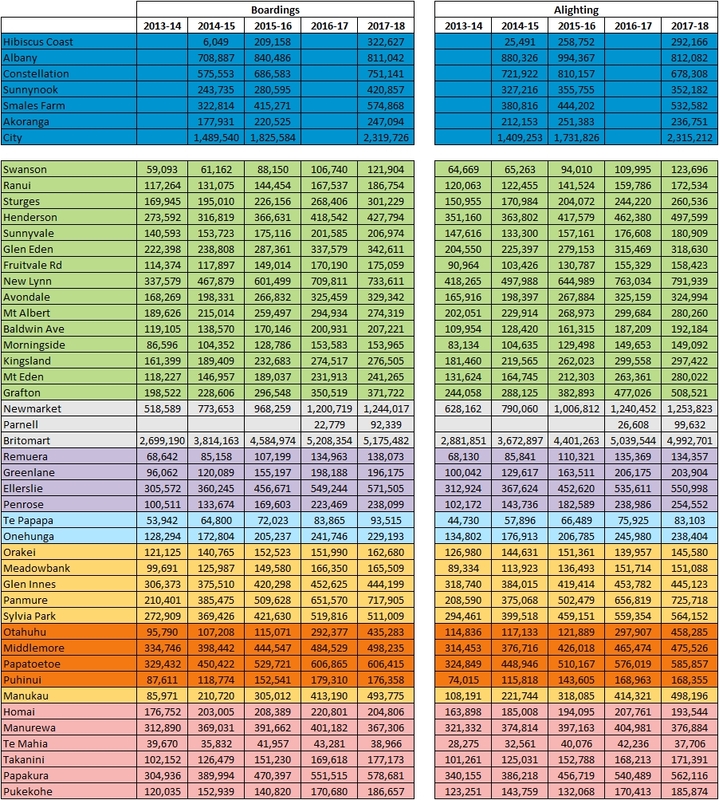 The Busway stations aren’t included in here as we don’t have last year’s data to compare it to. The busway stations are very well. Interestingly Albany has actually dropped a bit since the last data we had and I suspect that’s mainly related to the increased use of the Hibiscus Coast Station. Panmure has been growing strongly in recent years and if current trends continue, will see it replace New Lynn as our third busiest rail station. For some reason, a lot more people alight trains at New Lynn than board though so New Lynn is still quite a bit higher in that regard. Once the Eastern Busway eventually opens I suspect Panmure will be significantly busier station. Otahuhu has shown impressive growth and AT should have been using it as a poster child for feeder buses during the Herald’s Park & Ride campaign. In the first full year since the upgraded station opened and the new bus network was launched in South Auckland there were 435k trips, up from around 100k a few years before. To get that kind of growth with P&R would have required at least 700 carparks requiring a significant amount of money and land. Parnell has been open for more than a full year and is still performing poorly with fewer than 100,000 boardings. Despite having all Southern Line trains stop at the station, along with Western Line trains in evenings and weekends, the station still has fewer boardings than Te Papapa, a station that at best only gets half-hourly trains. We hope this drastically improves now that all Western Line trains are also stopping there and once the improved access to Nicholls Lane opens. A number of stations saw decreases in boardings this year which is not usual. It’s not clear what caused this. Downhilling from Grafton remains popular with there being over 130,000 more trips alighting than boarding – downhilling is where someone gets off a bus/train at the top of a hill then makes their way to a station at the bottom so they don’t have to walk back up the hill. 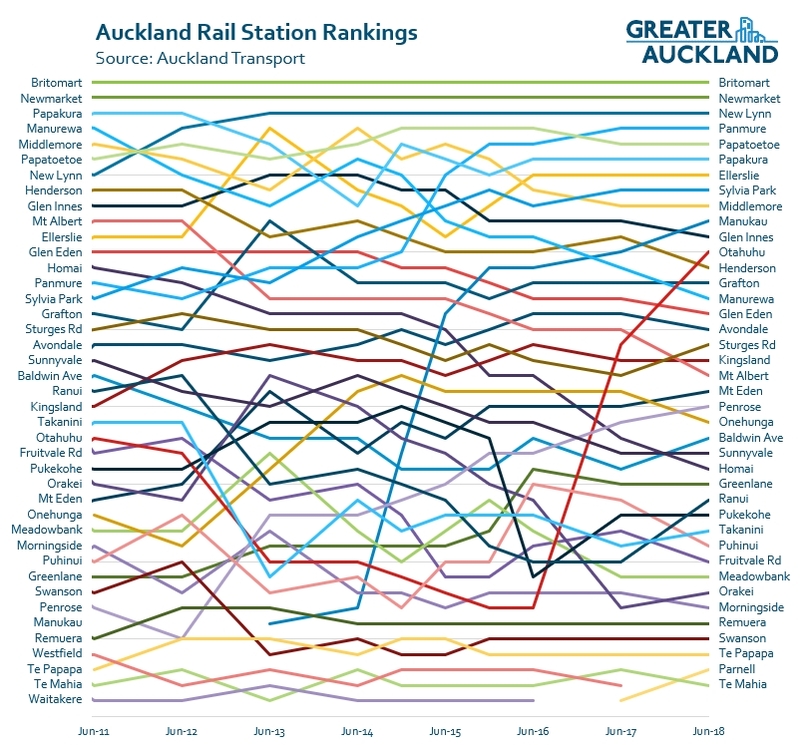 You can clearly see the stratospheric rise of Otahuhu in the rankings to now become the 12th busiest station. Manukau has also continued to improve and I’d expect it to keep doing so over the next year with the bus interchange now open. Penrose is another station that has been climbing the ranks fairly consistently over recent years. With fewer than 40k boardings, Te Mahia is once again the lowest ranked station. Even Parnell, the next lowest, has over twice that number. It will be interesting to see if the station upgrade currently underway will change this at all. If you want to make some visualisations of your own, the raw data for the last five years is here. Mt Albert’s drop in numbers possibly relate to the drop in Unitec enrolments plus the impact of works to upgrade the town centre. Or they may just reflect the fact that frequencies on the Western Line remain below par and AT have done nothing to improve travel times. In the 4 years since June 2014 I would have expected the Mt Albert – Baldwin Ave – Morningside stretch to have had a steady climb, as it’s so close to town it should be being intensified in a non-car-dependent way. Walk up catchment should be good. What’s failing in the area? Is it that the development simply isn’t happening, or the rail doesn’t appeal, or some combination? I wonder if more are taking buses to the CBD now? The rail line from Mt Albert to the CBD is quite circuitous and terminates at the bottom of the CBD. I imagine all of these stations will see significant growth after the CRL opens. Yes, you could be right. The buses are good in the area. Agree. When one’s destination is uptown (I need to get to the Civic to catch a North Shore bus there), it’s tiresome that the train forces me to go downtown to Britomart and then have to catch the CityLink bus uptown. The CRL can’t come fast enough. Hopefully Te Mahia picks up after the new Fletchers development at the old Manukau Golf Club gets finished. Otherwise the recent investment in the station would be wasted. That whole section of the Southern Line should be getting station locations rationalised in a holistic body of work including level crossing removal and bus interchanges at new overbridges. Under a true multi-modal transport investment regime this would be part of, and be funded with, upgrades to roads in the wider area, ie should part of the Mill Rd analysis and project. Plus of course freight management plans. Our institutions are not yet multimodal, still siloed by mode. Even if there is no budget for the work, this planning should be integrated and available, so funding priorities can be properly debated. Instead we just get a vast traffic generating road proposed and lobbied for with no work showing how this does or doesn’t fit in with the already existing and operating RT and freight route. 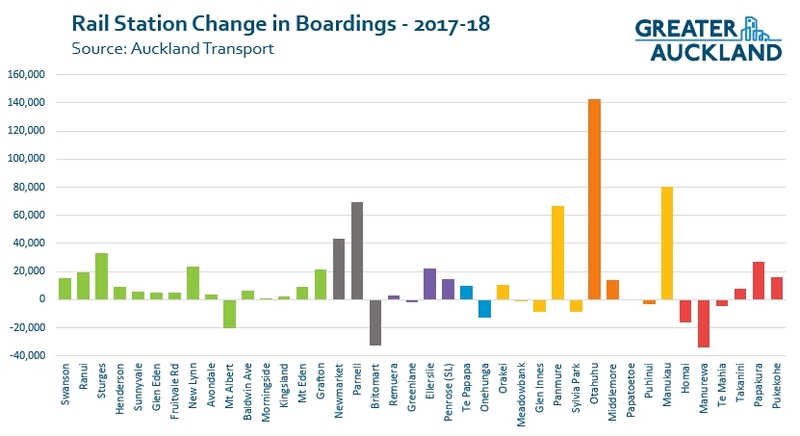 Which is interesting is that growth in partonage all three Manurewa stations (Homai, Manurewa and te Mahia) have steady fallen over the last few years. And over the last year between these three stations there is now 55,000 less boarding’s than last year. That is interesting as there are now no direct buses to the city (so your only option is to take the train), the new network has directed all buses so they stop at Manurewa station/interchange rather than Southmall plus there is now a covered walkway between the station and Southmall. You would have predicted this would have help growth at some of these stations (both Homai and Manurewa have park n rides plus bus links). The new network has not seen an increase in growth at this particular node…..I will be interested in seeing if gating Manurewa station will see improved growth or there is something more systematic causing the drop in patronage at these stations. The Manurewa Stations must compete with driving on SH1. SH1 is the route that was freed up by the Waterview Connection. Could this be the reason? … and when the travel times are back to what they were across the whole network, the net sum will have been an increase in trips, vkt, carbon emissions, road maintenance required, and sunk investment. Well done, NZTA. And all because you won’t include the increase in person-trips that new road capacity causes. I wonder if the gating of Manurewa has caused the dropoff in numbers ? They got off at Papakura, and I watched them walk off the station. None of them tagged off. As Immigration has changed some laws in the last couple of years for the International people – studying and working in Auckland. Quite a lot of international students were living in the wider Manurewa area, were taking PT to the city center for the studies/work. After the law change the number has declined. I believe this may have also impacted as well? Yes think this is all part of it, interesting. maybe…but surely it would have been bigger in areas near educational institutions. I do not see Manurewa as being big drawcard for international students. Old paptoetoe and Otahuhu both have big immigrant populations as well….they have not dropped off. Homestays, well I remember when living out that way friends had some staying with them. Just a minor factor I guess. You also gotta keep in mind that gas price were lower during this time period so that might have contributed. It is well known that South Auckland is very car dependent. Somehow I don’t see Parnell picking up. That’s a station in the middle of nowhere. Not connected to anything, whichever way you want to go (Parnell village, Auckland Museum or Auckalnd Uni – it’s a steep uphill. Completely wasted opportunity really. The only upside is that once CRL is operational we won’t have too many trains wasting time there. With the new walkway it is connected to Stanley St/Beach Road area. It also offers a shorter and quicker route to Auckland University compared with the slow crawl into Britomart followed by a double back. Is it still a slow crawl – I thought people were saying the new timetables had improved that? Well seeing it’s a 90 degree turn to the right immediately followed by a 180 degree turn to the left with a crawl down the tunnel I don’t see how any timetable change can improve that. You’re both right. The trains still crawl along as they always will, but the new timetable appears to have significantly reduced the amount of time the trains spend waiting at the Quay Park junction and in the Britomart tunnel, so they are faster overall. Parnell has the same issues as before, namely the platform has not been connected as it was planned, so it’s marooned in the middle of nowhere. It’s a start to connect it to the Carlaw Park area, as was the plan but until AT get over themselves and pretending to be fiscally prudent, and build it as planned, it is just a monumental waste of money being left in its half finished state! That’s great to see, Matt. Thanks for your work. Does Pt Chev Town Centre qualify as a public transport station? We certainly have a lot of Hide and Ride here because of the excellent buses along Great North Rd – and will see more when the Grey Lynn Residential Parking Scheme starts next year. I’d love to see a space in the shoppers’ carpark converted to a bike park for shoppers, but it may be that there should also be one in the area with secure bike storage for people who are wanting to take the bus. A comment on Sunnynook Busway station numbers. Very impressive numbers for the smallest station which only has one platform each way, hardly enough room for three buses. There is no park and ride and no feeder buses. The southern facing platform has only a tiny cover, nowhere near enough for the 50+ people constantly on the platform on winter mornings. The northern platform only has one exit up steep stairs and ramp with no cover over them – treacherous in wet winter weather. The numbers 400K+ boardings and 350K+ alighting surely justify improvements being made. Some of the new timetables for the Northern new network have been published and AT is finally going to have one feeder bus for Sunnynook Station, a new route the 907. However when looking at the Takapuna/Milford/Lower East Coast Bays timetable brochure available online AT have forgotten to show the new 907 route on the route map for the area although the timetable is there. I have already called and emailed AT about this but don’t hold out much hope of them correcting it before the network goes live. Can anyone tell me which stations currently have gates? And which are in the process of getting them? Britomart, Henderson, New Lynn, Newmarket, Otahuhu, Papatoetoe, Manurewa, Manukau to my knowledge. Don’t know about Papakura, Pukekohe, long time since I’ve been to those. More info in case your question relates to the arrangements for tagging on/off when transferring: the gates at Henderson, New Lynn, Newmarket and Otahuhu are on the second levels, above the platforms, and there are no tag terminals on the platforms at those stations. If you need to transfer from one line to another, for example at Newmarket or Otahuhu, there’s no need to go upstairs and tag off and on again. The system knows from your tag on station and destination tag off station what you did. No, there are no gates at Papakura or Pukekohe. spent a whole lot of money there. Maybe it’s the cost of staffing them ? I imagine the volumes wouldn’t justify the costs at Pukekohe. The majority of users are probably going to a station at the other end with gates anyway. Panmure must surely be a station that deserves gates. Probably upstairs in the rather large empty entrance. At the moment, tag terminals on the southbound platform are hidden from view at the sides of concrete pillars, and even though I’m a regular user there, it’s always a hassle finding the nearest terminal and where it is in relation to the escalator. In other words, things are not intuitive and one can easily walk away from the escalator by going to the nearest visible terminal. It’s awful and even at offpeak times there’s often a queue at the terminals. Put gates upstairs ASAP please. Also, the adjacent bus shelters are truly the coldest and windyest in Auckland with the bus lanes forming a virtual wind tunnel. How about some seating inside the station for those forced to wait up to 30 minutes for a connection. Not a single seat at present despite all that empty space. One of the reasons Panmure hasn’t got gates is because a very high percentage of passengers go to Britomart, gates are only needed at one end of the trip to enforce payment. Panmure also has three entrances, I’d hate to see this reduced just to make gating easier. I think ease of access to stations should always trump gating if there is a conflict. I agree with you about the location of tag on/off posts though. It would be good to see some maybe in a line in the concourse so people could flow more freely on and off the trains. Still trying to work out why Panmure has three concourses TBH. Seems to be one or two too many…. It definitely needs two – one for the bus station end and one for the northern end, the majority of foot passengers arrive from the northern end. The middle one is mainly used by PNR passengers, which might not be the most important group to target. Agree Panmure surely could do with some indoor furniture and more tag posts. Also Sylvia more posts. While I think of it I reckon the tag posts are too low. Not sure why they are so. Could be for children or wheel chair users but even so still would be low enough if higher or the screen more upward facing. Users don’t bother reading the screen often as too hard to do naturally (ie crouching or crooking of neck). There is at AT page on this if you Google it or search in their site search thingy. Tells you current and planned gated stations. I think Heidi is more likely to be correct….more people are driving (unless there is a lot of fare evasion). Manurewa/Homai stations did take a hit when eastern line train stopped going to Papakura. I feel that the only solution for these stations is intensification within the catchment. Homai and Te Mahia do not offer that much opportunity within walking distance (due to current land use). Interesting to note though a piece land near Te Mahia station has been offer for sale as potential area for apartment development. Manurewa towncentre has vacant land but the local board is not in favour of intensification. I hear that the sales of the Flectcher houses are slow…maybe they are too expensive for the area. – “the local board is not in favour of intensification” How on earth do we get them upskilled? In what way does resisting development – and therefore relying on greenfields development to accommodate growth – serve this community? All it does is create more car dependent development, thus more cars being driven through this area. The local board needs to understand that they are therefore exposing their children and elderly to more risk through the position they have adopted; you could say they are enabling DSI. – “a piece of land near Te Mahia station has been offer for sale as potential area for apartment development.” The Point Chev RSA development is in limbo because the developer doesn’t think the market is right. Construction costs will be the same in Pt Chev and in Te Mahia. You’re not going to get the private sector to do it, if even in our over-priced swank suburb, they’re holding back. If it’s for sale, the Council should be buying it and enlarging its ‘core business’ to include providing housing. Or government should. kiwibuild has been created to deliver 100,000 new homes in 10 years, over and above what the market would otherwise have delivered. 50% of these are to be in Auckland. If this is to be achieved, they’ll need to be aggressively purchasing land like this. Hmm we know the South has a particular to commute within the South rather than go north of Otahuhu so I wonder also if there has been a job shift with more of the south coming out of the City Centre and working at the Airport, Manukau and East Tamaki closer to home. The NIMBY Manurewa Local Board and Councillor certainly dont help things and I am nit surprised about the Fletchers development either with a lot more housing with better access to amenities in Addison and Manukau. Onehunga and Te Papapa could be effected as trail services no longer stop at Ellerslie and Greenlane, and potentially more than indicated as none of stations are gated. Looking at some of those barely used stations, it further convinces me that light rail will be much more successful than heavy rail has been. For example light rail from Airport to City adds about 20 new stations to the network, almost all of which are well located and will have a good catchment of users. Agree. And the other thing is: Do Council look at the “Rankings Rug” and pull out all the stops to enable walk-up catchment development around the bottom, say, 10 stations? This is the necessary response to the AA and Herald’s parking campaign: Yes station access is a vital issue, and AT need to find the resources to improve it all across the network. Safe and direct walking and cycling routes, secure bike storage, great bus connection, high quality, high frequency bus routes with street priority. Good drop off zones, parking for mobility card users. And, finally, parking, priced, where appropriate and good value for money. Particularly at those outer satations serving more dispersed catchments without good feeder services. In a world with more resources being poured in PT, I’d agree,however if there was a choice of removing level crossings or improving access to stations, with the same travel time, I’d be picking level crossings. Based on safety considerations? Point is really moot, I suppose, because the answer is to reallocate funds from the destructive road capacity expansion projects, and then we’d have enough to do it all. But failing that, could it not be argued that the increase in health from improving access and thereby getting people active again (see Healthy Streets post) will save more lives than removing level crossings? The impacts from what Patrick is suggesting are fundamental and huge. I believe after the carlaw park short cut is finished (University to Parnell train station shortcut), Parnell station would increase its patronage. A use case would be students arriving by britomart and leaving via parnell. And after the CRL it won’t be used again? It’s actually worse than that as the grey line would require trespassing across the rail tracks and a bush bash to get to the track! There is a path that runs direct from the western platform to the student village under construction at the moment though. The grey line actually is correct. I used it myself recently. There is actually an underpass beneath the railway line at that point. Actually I’m wrong, the grey dotted line isn’t correct. Jezza is right. You need to continue down the main path to the railway line where the underpass is. No. There’s a goat trail type thing off the path. And there might be some more of those I don’t know about. Mind you that map does suggest the initial entrance on to lower domain drive is unofficial… it’s certainly got the bush walk portion completely wrong. But eventually the path that you can see marked by the sign here joins up with where you are with the first one… not that the map represents this in your initial ink. To clarify, there’s no reason to go on to Lower Domain Drive to get to Carlaw even without official routes and the fastest way to UoA I mentioned does involve walking across some grass so it’s not really practicable in the winter and I increasingly think it’s only faster when mud is not negotiated (so, again, not a winter route). After the shortcut is built, there will be a direct link straight to Nicholls lane thru the carlaw park student village. The walk will be very short. close to the kiwirail headoffice. I think Parnell is one of the nicest stations. I like the setting and the restored station, it’s a work in progress but it is getting better all the time. It could easily become a destination in itself with a cafe etc in the station building. So there is no cafe in the station building? Is it just a nicely restored, nice to look at, but completely unused and useless building? I was actually thinking about a Parnell station cafe as a destination, something decent to spend a while eating a meal. Like Swanson station cafe or the two platform cafes at Glen Eden. I know a few people who travel to Swanson just for the cafe experience. The Domain needs a complete redesign, in order to reclaim it from the car. It could be a fantastic place for CBD residents, workers and visitors to enjoy actively. As it is, rat run traffic on roads with no footpaths or very narrow footpaths ruin it. If you do this design well, it would have points of interest throughout it, adding to the Wintergarden, Fernery, Museum, playing fields. I think some well-located kiosks and cafes (without parking) would be fantastic. I wouldn’t bother with a cafe at the station unless it somehow enhanced the reactivation of the Domain. I don’t know, it would take away the very Aucklandness of the Domain if we made it more pedestrian friendly (or pedestrian friendly at all) and got rid of the vehicle rat run. A cafe at Parnell would indeed be interesting. I use the station all the time and have to agree it’s a nice setting… if we ignore the enormous and phenomenally ugly carpark anyway. It is probably more appropriate, however, to see it as a cafe serving its immediate area than the Domain per se being quite far away from the interesting parts of the Domain… although if it were decently priced (fat chance) I am sure it would draw at least some people away from the rip offs in the Museum and by the Winter Garden. To the point about the user friendliness of the Domain/its suitability as a destination. I find, in general, the thinking on this blog and its comments section too little picture when it comes to the Domain. Yes, it’s basically right there in centre of town (kind of) but it’s a regional (national even) amenity. Its major issues strike me as being two fold. Firstly, very poor pathing… I believe it is still impossible to take the direct route from the station to the Museum without having to walk on grass and there is, I believe, only the single crossing (by the duck pond). Secondly, the toleration of the Domain as a motor vehicle commuter shortcut. Lower Domain Drive could be closed completely. That’s one option. Another option would be to gate it. The Museum does tickets. Treating the entire thing as a giant carpark would surely satisfy both Heidi’s calls for greater pedestrianisation and Jezza’s plea to preserve the area’s historical character! No, the domain is not dominated by cars. It is car dominated however due to a lack of pedestrian and cycle paths of which there is plenty of room for these to be built. I have never once been walking through the domain and been unduly delayed or made to feel unsafe by cars there. By all means build more paths to provide better access for everyone but looking to restrict car access there simply because you don’t like cars isn’t going to change anything. I use parnell station daily, now with the western stopping there I am seeing more people using it. It will be an asset to the network long term. Close to the museum and best way to get to the french markets. 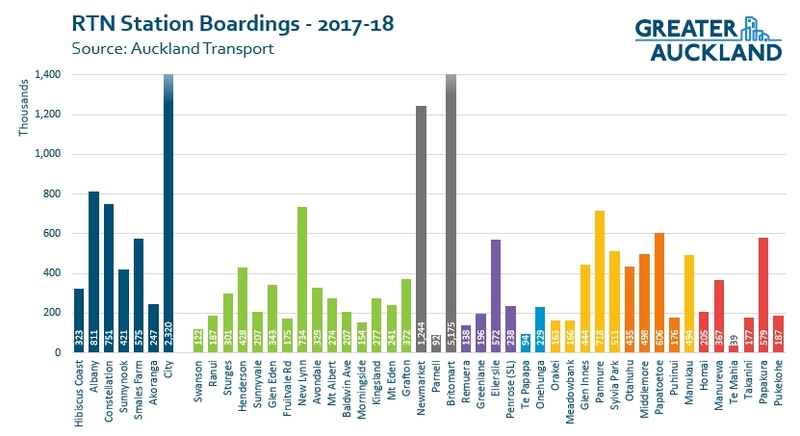 Can anyone shed any light on why relatively Manukau boardings are so poor? I suspect it is the abundance of cheap parking in close proximity. I note that until very recently it was cheaper to park each day than to take a two zone journey. I had never really been to Manukau until about 3 years ago. I had expected the station to get massive ridership in a major centre. After moving to Hamilton I went there a bit more often as a halfway meeting/stopping spot from friends and family on the shore. I realised that there is *nothing* there. Its just carparking with a couple of mid sized buildings. It looks like some stuff is actually getting built which will help, but it probably needs at least 10 high rise buildings to even make a dent in the need for human activity. As per Manurewa and that area in general comments above but also their new bus station & East new networks only opened part way through this last year stats.